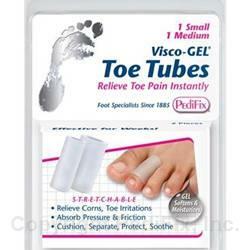 Soft Gel Tubes protect toes from pressure and friction and separate toes that rub. Relieve corns, crooked and overlapping toe irritations. Fit comfortably in most footwear. Each package contains 1 small and 1 medium Tube that fit most toes. 2 per pack (1 Small, 1 Medium). Slip over toe. Test for comfort. Remove and trim length, if needed. Pull on hosiery carefully and readjust as necessary. For best results, keep nails trimmed and do not wear shoes that interfere with toe freedom.